Pakistan's nuclear-capable, short-range, solid-fueled Hatf-3/Ghaznavi/M-11 (total number estimated at 34-80) ballistic missiles are also believed to be stored at facilities near the Central Ammunition Depot at Sargodha. The evidence captured on U.S. satellite imagery includes missile crates, storage sheds for transporter-erector launch vehicles, missile maintenance facilities, and housing. The Pakistani military has also been sighted conducting simulated launches with assistance from visiting Chinese experts. Indian intelligence sources believe that in an attack scenario, the missiles would be dispersed and re-deployed at Gujranwala, Okara, Multan, Jhang, and Dera Nawab Shah, where defense communication terminals have been constructed. 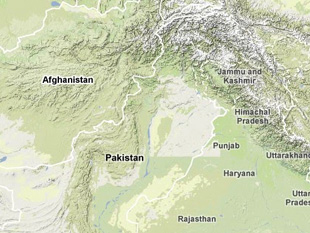 Estimate based on IKONOS satellite imagery: Space Imaging, Sargodha-ab-ik-br, accessed 8 February 2011, www.globalsecurity.org. “PAF Active Bases,” PAF Official Website, accessed 28 January 2011, www.paf.org.pk. "Sargodha Air Base: Central Ammunition Depot-Pakistan Special Weapons Facilities," Federation of American Scientists, 28 January 2011, www.fas.org. “NRDC: Nuclear Data, Table of Pakistani Nuclear Forces, 2002,” Natural Resources Defense Council, Accessed 3 February 2011, updated 25 November 2002, www.nrdc.org. Dinshaw Mistry, Containing Missile Proliferation: Strategic Technology, Security Regimes, and International Cooperation in Arms Control (Seattle: University of Washington Press, 2003), p. 119. “Sargodha – Pakistan Special Weapons Facilities,” Globalsecurity.org, accessed 28 January 2011.